OK, so that might be a slight exaggeration, but it the greatest stain fighting discovery I have come across in a very long time. 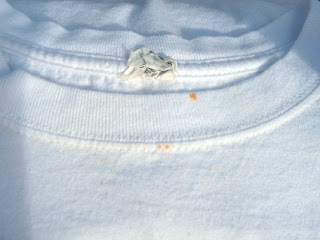 You know those little rust colored mildew spots you get on your clothes sometimes? My mother always told me that they come from something wet in the laundry basket (see I was at least able to work one basket reference into this post) laying up against other clothes. Since these very often appear on my sweaty gym clothes I think there must be something to this explanation. Anyway, I was reading on Yahoo News the other day about 101 uses for salt and on the list was how to remove mildew stains. Well I thought it was too good to be true, but thought I had nothing to lose as I was going to have to throw away one of my stained favorite white ringer t-shirts anyway. I had already tried bleach and OxyClean with no success. The article said that all you had to do was wet the spot with lemon juice, add salt and lay out the item in the sun. 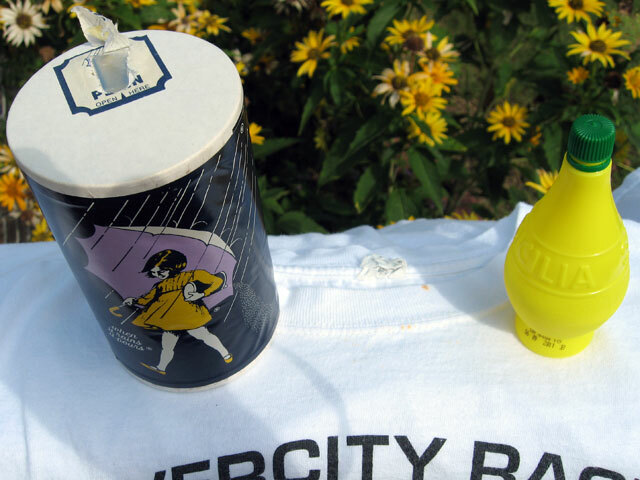 Well I was motivated one evening to try this so dug out my t-shirt, plastic lemon from the fridge and the Morton's salt. 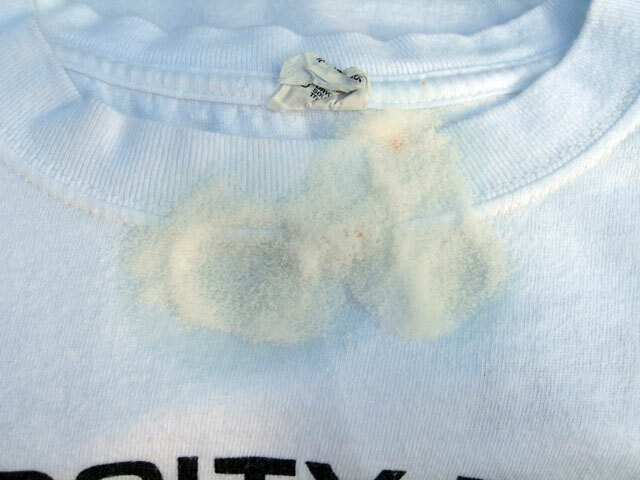 After two applications of the salt and lemon the stain was significantly lighter and if the spot hadn't be right in the middle of my chest I probably would have worn the shirt as it was. So today I thought I would give it one more shot and follow all the instructions and lay the shirt in the sun. And wouldn't you know it (or maybe not since this was news to me) after about an hour or so in the sun the lemon/salt patch was dry and the spot was completely gone! I am laundering the shirt as I type this, but when I checked it before putting the load in the dryer the stain had in fact been removed. I am simply amazed. I wish I had all the clothes I have thrown away over the years back. I wish I would have taken before and after photos, but I think I have another shirt to try it on. 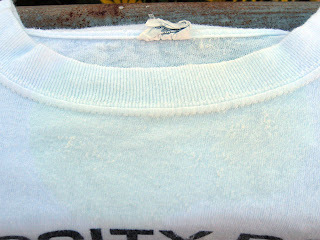 I just treated another shirt and I took photos this time. After a couple hours in the sun the salt is dry and the stain is gone. There is a touch of discoloration from the lemon juice, but that will wash right out. 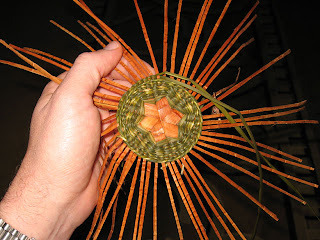 This year at the Missouri Basketweavers Guild convention, Weaving MO Madness, I was fortunate enough to take a class on the last day with Peggie Wilcox (pictured above). 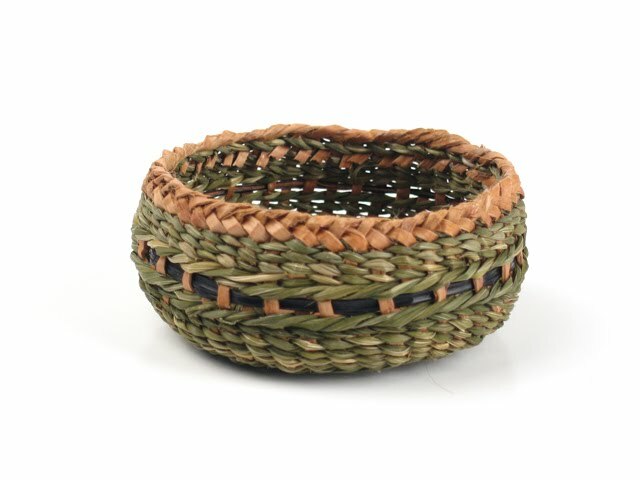 Peggie works with all kinds of natural fibers, many of which she collects and processes herself, including cedar, Siberian iris leaves and madden head fern. While I used to twine quite a bit when I first started basket weaving, I haven't in quite a while and I really hadn't used materials like these. The cedar uprights were so interesting to work with. They were surprisingly strong and supple. We split the 4" long Siberian iris leaves in two with a needle and used those to do the twining and three-rod wale. 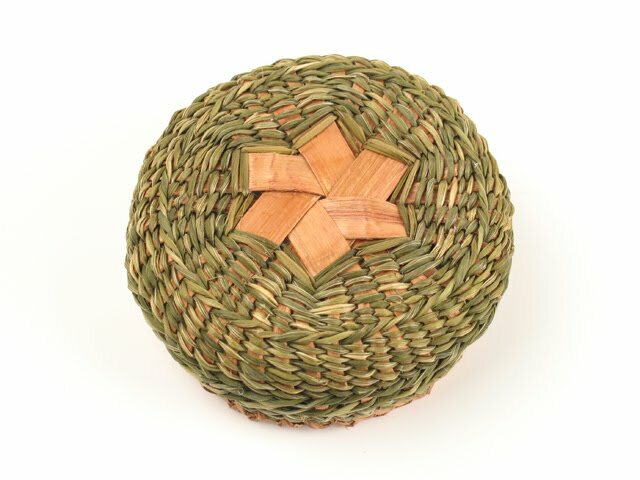 My favorite part of this basket is the star-shaped or "mad weave" start. I will definitely have to try that again on some project. 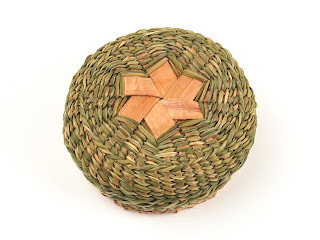 The finished basket is about 3" in diameter and 1" deep. I didn't do as nice of a job on the rim as I would like to have. It is a bit wavy. I could have pulled it much much tighter as the cedar bark is very strong. The black band around the middle is maidenhead fern (or possibly maidenhair fern). I started making these on a whim about three months ago. 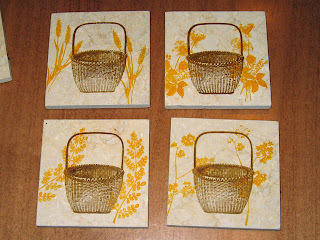 The first ones were on basic ceramic tiles that I had left over from an old stamping project, then I found some great tumbled marble tiles at a surplus outlet (I bought all they had and of course they have never gotten any more in) and now I am making them on limestone tiles. I really like the new tiles, but unfortunately they cost twice as much as the marble or ceramic so I have had to raise my prices a bit. I use StazOn solvent-based ink pads so they are water proof and durable. 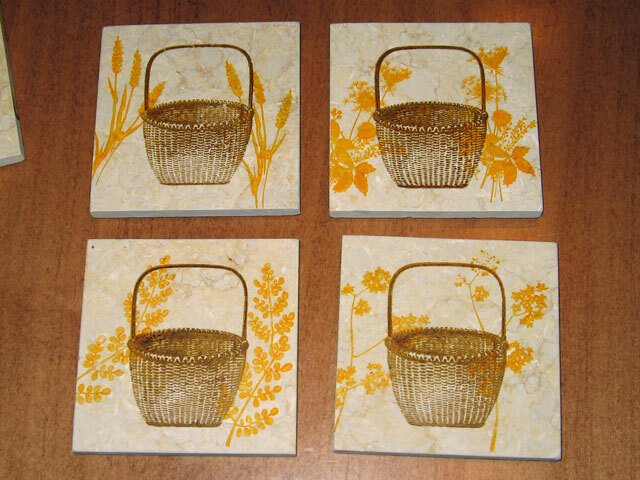 I tried to clean off a mistake and was never able to complete get it off of these tiles even after using paint thinner. I recommend that they only clean them with water though, just to be on the safe side. I will be offering these, along with a variety of other basketry related items, including my weaving stands, at the Missouri Basketweavers Guild Convention next week, Thursday, August 5 to Saturday, August 7, 2010. 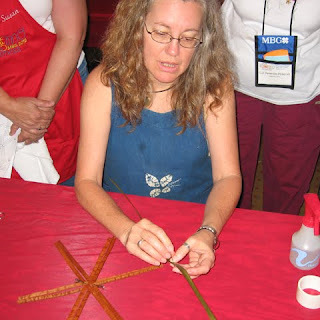 On Sunday I am actually taking a class with Peggy Wilcox, so am very excited.